Creating color harmony is the act of putting multiple colors together to create a palette of harmony. Using different colors in different ways can greatly affect the character of your quilting projects. When I am working on a new quilt project or designing a new pattern these are the the steps I take in choosing my fabrics. I will be demonstrating these steps using my quilt pattern Concerto. Consider how you want the quilt to be perceived. Perhaps you’re making a quilt for a new baby girl and you want it to invoke feelings such as fresh, new, and sophisticated. You can achieve this perception through your quilt by using colors properly. With a desired perception in mind you can now start exploring colors. I have a few go-to places where I search for color inspiration. 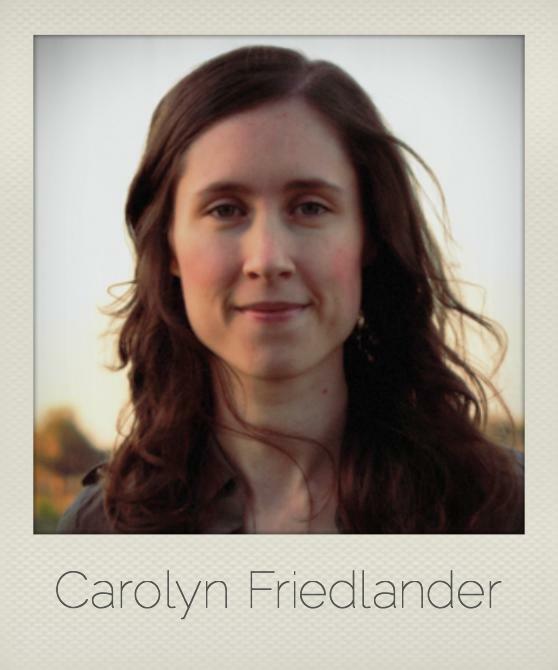 Design-Seeds is a blog that posts a new color palette each day. These palettes are based on beautiful images. This is a really fast way to find a pre-built palette for your project. Many bloggers and designers create palettes like Design-Seeds and I have found that searching for “Color Inspiration” on Pinterest can help you find the jackpot. I also have my own Pinterest board for Color Inspiration. If you would like to play with different schemes using color rules like Triadic, Monochromatic, and Analogous, then check out the free online app by Adobe called Kuler. This app has a very clean, easy-to-use interface. If you would like to pull colors from an image of your own just as the Design-Seeds blog does, then a great tool is Palette Builder 2 by Play Crafts. This app was specifically designed for sewists and gives you a list of coordinating Kona Cotton solid and Aurifil thread colors! After you're done exploring, you will need to choose a few palettes. 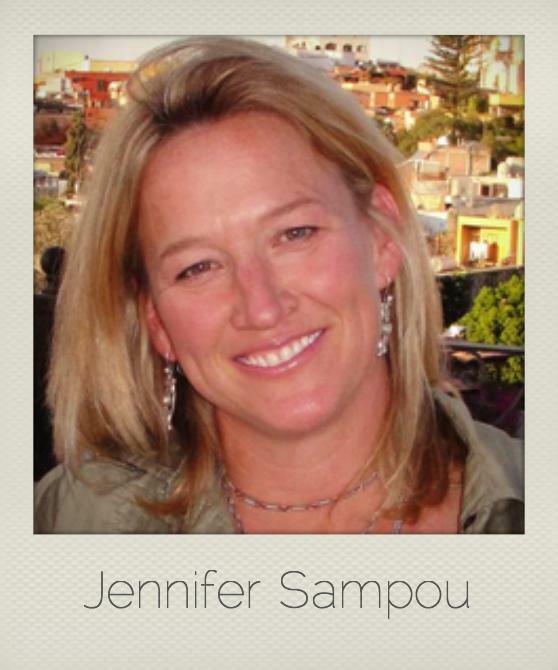 In the example above I have chosen three color palettes that I feel closely fit my desired perception. Before you get too excited and start pulling fabrics from your stash every which way it is important to audition the palettes and choose a winner. Here are some ways to audition colors. You can get our your colored pencils and mockup the quilt design on paper. 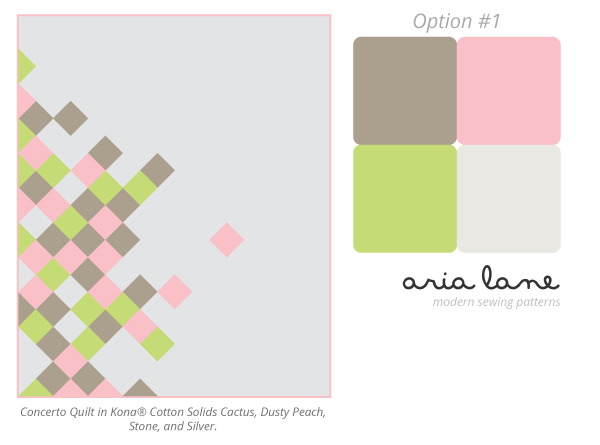 Aria Lane quilt patterns include a Quilt Top Coloring Sheet that you can make copies of and color till your heart is content. Being a pattern designer myself, I have all of my quilt designs already on the computer using Adobe Illustrator. On my blog you can find Kona® Cotton Swatches that make auditioning any Kona® Cotton color in Adobe Illustrator or Photoshop super fast and easy. I always start by auditioning colors using solids first. After auditioning all your palettes choose the winner. My choice is option #3! I personally love working with Kona® Cotton Solid fabrics in quilting and use them more often than I do printed fabrics. In fact it can be a lot easier to choose fabrics using solids and is a great place to start if you are a beginner. If you want to make a quilt from just solids you can convert your color palette using a Kona® Color Card. But, what if you want to use some prints? If you want to go a step further and try out prints, then its time to raid your stash or start shopping! When using prints it is important to consider three important factors: scale, density, and dominance. These work together hand-in-hand! The main design on a printed fabric will fall into one of three categories: large scale (4” or larger), medium scale (around ½” to 4”), or small scale (½” and smaller). When you are quilting, you must consider the fact that the fabric will be cut up in to pieces, most likely small pieces. How will the print look cut up? Prints on a fabric are often spaced either showing little to no background, or spaced showing lots of background. The density of the spacing will greatly affect the next factor – color dominance. Dominant colors will tend to “push through” the design so they are the main color (or colors) you see, while recessive colors blend into the background more. When you’re choosing fabrics based on a color scheme, determining the dominant color in a fabric will be absolutely crucial. It’s not always possible to find the perfect print in the exact color you used in your original palette. That’s okay, you’d be surprised how these little variations turn out for the better! In the example above I started out with my solid fabric version (left) and built upon it. Next I tried out using blender fabrics, RK Quilter’s Linen (middle). Then I started playing with prints from different collections like Carried Away, Botanics, and Architextures (right). 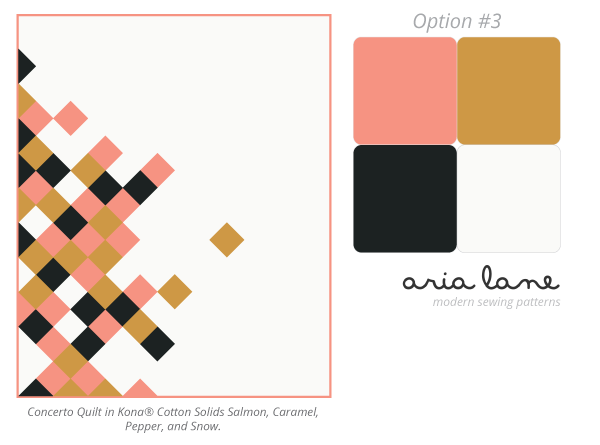 Here are a few more examples of this process played out in some Aria Lane quilts. In conclusion, remember to start first by establishing the desired perception of the project. From there you can go color crazy. Also remember that it is easier to learn to work with color and fabrics if you first start with solids. When playing with prints, always consider the three factors: scale, density, and dominance. Ultimately working in this order can really help your color/fabric choices to evolve and take life! 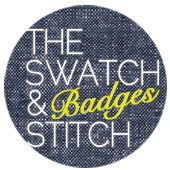 Alyssa Lichner is a freelance web and graphic designer turned avid sewist. She writes modern quilting tutorials and share techniques and inspiration at my blog Pile O’ Fabric. 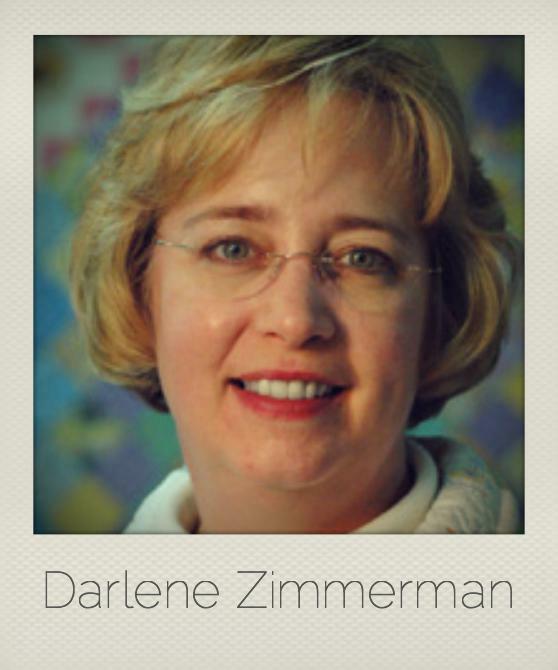 Together with her husband, she is the brains behind Aria Lane, a new modern sewing pattern publishing company.